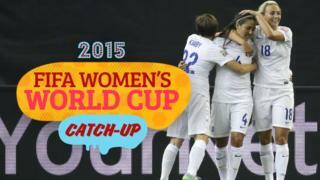 Catch up with all the best action and the quirkier moments from day 12 of the 2015 Fifa Women's World Cup in Canada. England qualified for the last 16 after a 2-1 win over Colombia, while France easily beat Mexico 5-0 with Amandine Henry's superb drive the pick of the bunch. Also keep an eye out for Eniola Aluko getting startled by the overhead 'spider' camera at Montreal's Olympic Stadium.